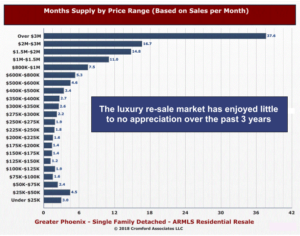 Phoenix has enjoyed a reputation of “affordable housing” due to its large land mass. Whenever more houses were needed, builders had plenty of land to build them. A steady source of new supply kept pricing low. This brought about the “drive until you qualify” phenomena as the valley expanded ever outwards. Builders are happy to build but land, labor and material costs make them unable to bring single family housing to the market in the price range most needed. When we look at the valley in the context of cities such as New York or Los Angeles – do most buyers in those cities expect single family housing to be available at 200K? No. So it may be that we simply are struggling to come to grips with our big city status. “So the good news for buyers is that we do have slightly more homes coming onto the market. The bad news is that this is not enough to ease the supply shortage. In fact it is not even enough to compensate for the higher sales rate in 2018 over 2017. Closings are so far up 3.2% year over year so a 1.4% increase is less than half what is required to replace homes sold. So perversely, but not unexpectedly, we are getting the largest percentage increases at the high end of the market where more supply is not really needed. Below $200,000, where supply is already extremely thin, the new listing flow has dropped even further from last year’s rate…. If you are a seller – the price point you are in will affect your “home selling experience. Typically, the lower the seller is on the pricing scale – the higher the odds of multiple buyers competing for your home. When demand is out of balance with supply, in favor of sellers, multiple offers occur and there is upward pressure on pricing. This would all appear to be good news for sellers, right? Well yes, but a strong seller market can hide mistakes that cost sellers thousands of hard earned equity. For example, sellers can decide to “go it alone” by either selling the home to a friend or neighbor or to a “we buy houses company”. To many that looks like success – one buyer and the home is sold without placing it on the market. To us in the business, that looks like a disaster. How can you know for certain what a “competitive” offer is without competition? Any home has a range of value. What pushes homes to the top end of that range? Competition. Capitalism is based on that very concept. Competition (thru marketing) is how we as agents create bidding wars for the home. Sadly it isn’t enough to create the competition, once created one must know how to handle it. How an agent handles multiple offers separates the men from the boys. This again is where thousands can be made or lost. Make sure that whomever you hire knows how to get the highest and best out of each offer and to successfully exploit that competition. It is important to note that supply and demand imbalances will correct with time. In fact, we are already seeing lowered demand than last year. The cycle basically goes like this: tight supply increases pricing; increasing prices dampen demand; lowered demand creates more supply; more supply lowers prices. So the pendulum of supply and demand (and thereby pricing) self corrects with time. When will that correction begin and supply begin building? We don’t know but we will be watching for it and will keep you alerted to any shifts. Wondering about something we didn’t address here? Contact us. As always, we are happy to answer your specific concerns. She is an eighteen month old calico tabby, she is a brown tabby with orange sprinkles. Kimmie is outgoing and social, doing her best to get everyone to play. If you don’t play with Kimmie, she will entertain herself while putting on a show for you. 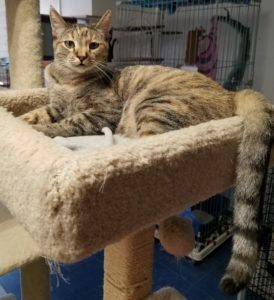 Kimmie also does her best to make friends with the other cats and kittens at the shelter. Come down to Home Fur Good at 10220 N. 32nd Street in Phoenix. The Free Roaming Cat Room is open for adoptions Thursday, Friday and Saturday from 11am – 4pm. You can also call at 602-971-1334.